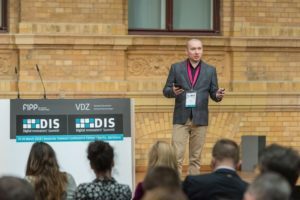 Throughout the Digital Innovator’s Summit (DIS) 2018, representatives of companies fromacross the globe took to the stage to share their insights about how they are growing their businesses. For the mid morning segment on the second day, Matt Egan, Editorial Director at IDG, explained how IDG has adapted its business model and where it is likely to venture to in the future focusing on premium quality content as being at the core of its strategy. Matt explained that IDG is an independent global media company with both print and digital products. Matt then ran through the organisational structure of IDG explaining how it has “boots on the ground in many countries,” but that its strategy is determined by languages and cities. The teams in its core cities develop best practices which, when aligned to local knowledge, work successfully across the globe. He then described how the US B2B editorial team are defending specific search terms with high quality responses. “We are combining traditional arts and science,” Matt said. The data is then deployed to make the most of the monetisation opportunities. For example, tracking someone who is making a purchase after being through an editorial page. A single visit from one such engaged purchase maker is infinitely more valuable than 10 casual readers. Although Matt added that while getting brands and readers to spend money is paramount, IDG’s approach is underpinned by editorial independence. He acknowledged that if IDG lost this it would not remain relevant to its audience. Matt described the audiences that IDG serves as being both global and local. The titles invariably focus on a specific niche in specific languages. There is also a focus on delivering content that readers can’t get elsewhere – IDG doesn’t, for example, major on news stories. Part of IDG’s core approach is driven by the quality of the editors it employs. Matt describes the approach as being “not data driven journalism, rather data supported journalism.” Editors use their independence, integrity and knowledge to help shape the titles so that they address the requirements of the readers. Matt finished the presentation by talking about the cornerstones of measurement and engagement.